Dynamic reports for PCs, tablets and mobile devices. 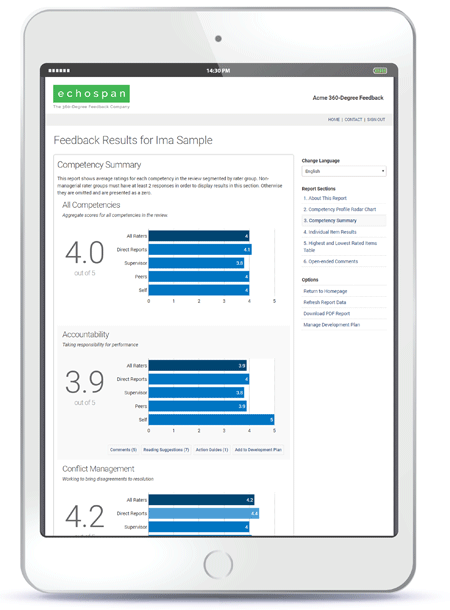 EchoSpan's Interactive Reporting features bring your employees' feedback reviews to life with animated graphs, drill-down analytics and built-in artificial intelligence. Feedback recipients will be able to quickly identify and act upon insights from their reviews with integration into the Development Planning Module. All reports are viewable on modern computers, tablets and mobile devices. Our Interactive Reporting tools are also designed to be flexible; project administrators can add, remove and modify components easily. All components work with more than 100 languages.